Take Advantage of the Increasing Demand from Russia. Every year more and more Russians turn online to find accurate information about the services or products they want to buy. With more than 31 million Russians travelling abroad, their most interested categories related to Greece are our beautiful islands, the type of vacations they can choose and what the choices are regarding hotels and resort accommodation. Take advantage of our digital advertising services targeting Russia, increase your direct Revenue and gain Russian market share. Be present when Russian users search. Get targeted traffic from Russian websites. Use video ads to inspire travelers. Prepare your website for Yandex search engine. Be present at the most popular social channel in Russia. About 56.5% of Russians are using Yandex, the most famous Russian search engine. Be present when users search online for information related to your business. 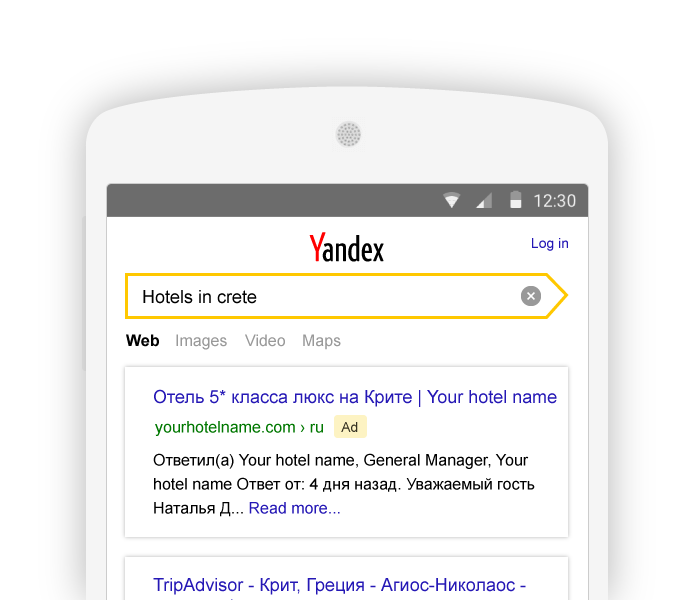 Increase potential clients radically by placing ads in the 1st position of search results and drive targeted traffic to your website with Yandex search ads. 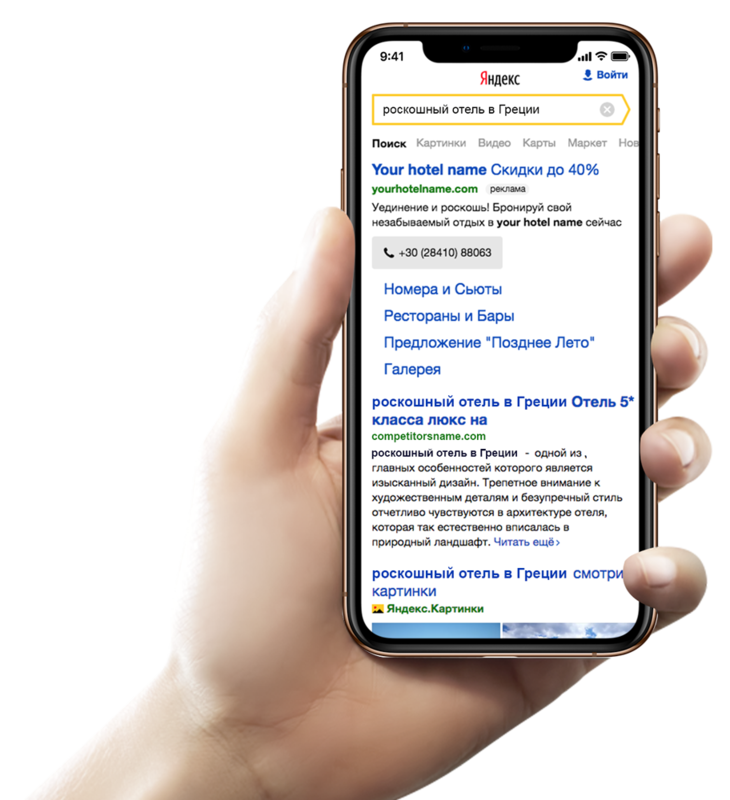 Yandex Display Advertising serves ads to over 50 million users daily, accounting for 87% of the Russian internet audience. Increase your business brand awareness today. The Yandex Video Network features KinoPoisk, the largest film service in Russia, and other popular Yandex partner websites. On these sites, you can place a multi-roll, a promotional video which plays before or after film trailers or other online videos. The best way to communicate your services to Russians is to speak their language. Your website must be optimized for Yandex, the no 1 Russian search engine. Optimizing on-page elements will result in higher organic (non-paid) rankings, generating a native incoming traffic to your website even when your ads are switched off. With more than 46 million daily users, VKontakte (VK) is the most popular social media platform in Russia. Expand and engage with your VK audience, turn them into loyal fans and customers. VKontakte offers powerful ad formats giving your business the opportunity to reach more potential customers based on specific interests and demographics. 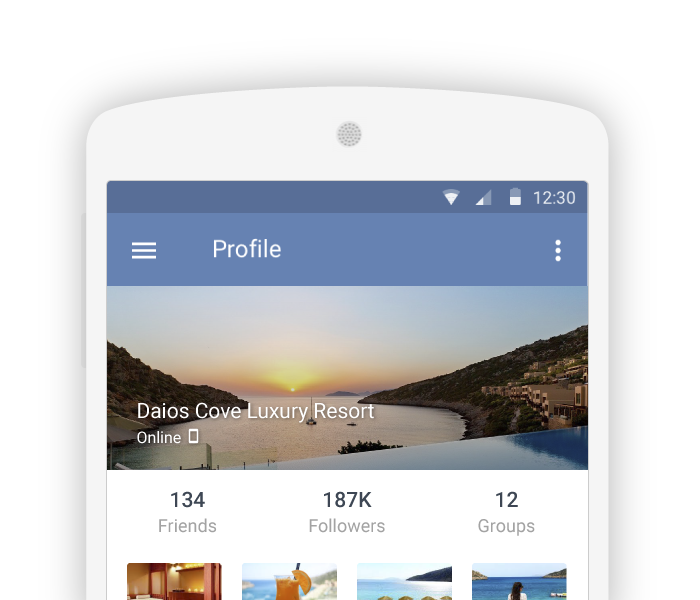 Reach more users online with Mozaik VKontakte Advertising solutions! Your inquiry was received successfully! We will examine your needs and reply to you promptly. Read insightful articles written by our performance experts team. * Ok, now what’s your monthly budget? Total increase in traffic from Russia in the last 2 years. Total increase in Year over Year Revenue from Russian customers. Increase in generated leads and 300% increase in online traffic from Russia.